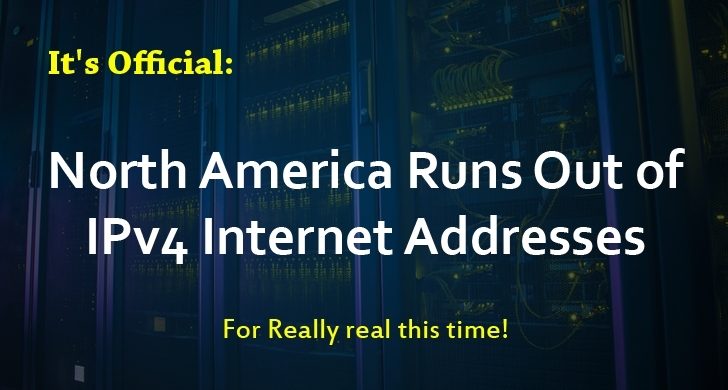 Two months ago, THN reported about a similar announcement made by The American Registry for Internet Numbers (ARIN), which said that the agency is no longer able to produce IPv4 addresses in North America. ...i.e. the availability of IPv4 (Internet Protocol version 4) addresses no more exists. Wait List for Unmet IPv4 Requests - Join the waitlist for unmet requests in the hopes that a block of the desired size will be available in the future. IPv4 Transfer Market - Can be purchased from another organization that has more than it needs. They say, "The source entity (-ies within the ARIN Region (8.4)) will be ineligible to receive any further IPv4 address allocations or assignments from ARIN for a period of 12 months after a transfer approval, or until the exhaustion of ARIN's IPv4 space, whichever occurs first." These changes will impact the organizations existing in Transfers between Specified Recipients within the ARIN Region (Transfer 8.3) and Inter-RIR Transfers to Specified Recipients (Transfer 8.4). RIR refers to Regional Internet Registry, like ARIN, which is one of the RIRs. Also, if they are successful in allotting IPv4 address pool to the waiting list entities and are still left with IPv4 addresses, then they will open the free pool for IPv4 addresses and add them there for future use. We see this is just the start of an era (IPv6). IPv6 was invented in about two decades ago in 1998, and it features much longer addresses, such as — FE80:0000:0000:0000:0202:B3FF:FE1E:8329. This means that IPv6 will offer a total available pool of 340 Trillion Trillion Trillion addresses, providing capacity for a very long term.